If your goal is to own some precious metal to take advantage of rising prices in those commodities, then by all means buy bullion. 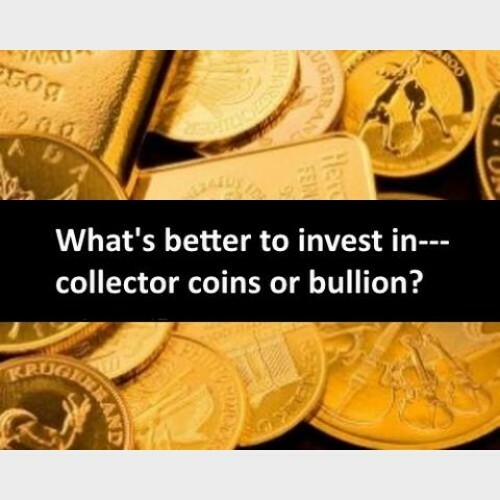 If you want to collect coins rather than invest in metal, with an eye for scarcity and condition, then collecting numismatic (collector) coins is your game. Regardless of the direction you choose, be sure to understand the terminology. 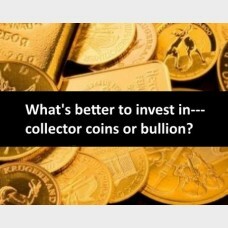 Many think that “bullion” refers only to bars of silver or gold. Fact is… bars or coins are considered bullion if purchased based on the item’s weight, the spot price and the market premium for the particular bar or coin involved. The market premium reflects local supply and demand factors in place at the time. The spot price is the price per ounce of the most recently traded commodity contract. Bullion coins of the past have in time become collector coins… Examples include Spanish Colonial gold and silver coins -- bullion coins in their day, that are now collector coins with considerable historical significance. Those that were salvaged from shipwrecks have additional appeal, especially if attributable to a specific wreck. Deterioration from saltwater, etc is overcome by the details of a great story. Likewise, the privately minted gold coins from the California Gold Rush era were produced as bullion coinage to facilitate commerce among merchants and miners in lieu of the vagaries of “pinches” of gold dust. The association with an intriguing historical chapter, small mintages, and unique designs make the private gold bullion issues of that time highly collectible today. Questions? Comments? Feel free to respond below.